Dalai Lama 6 July 1935 Choekyong Tsering Diki Tsering Lama, Actor, Author, Philosopher Dalai Lama, Tibet's political leader, has strived to make Tibet an independent and democratic state from China. He and his followers are exiled to India. 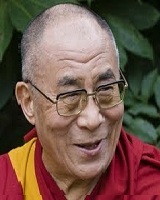 A list of popular dalai lama quotes are given below.